It’s late at night and I should probably be going to bed. But late at night is the time when I usually get to read and this book will definitely keep you up into the ‘wee sma’s’. 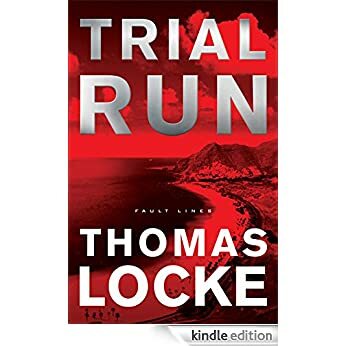 Trial Run by Thomas Locke (aka Davis Bunn) is a sci-fi thriller with some quantum theory thrown in with a side of teleportation/telepathy for good measure. On one side of the globe there is a group of radical scientists working on a project that they call ‘ascending’, projecting yourself mentally either into the past or the future. And on the other side there is another group that has stolen their research and is using it for stealing government secrets…except they are the government. Both sides have casualties that they can’t account for and no idea what to do about it. For a good chunk of this book we don’t know who the good guys are and who the bad guys are. Both sides have some pretty edgy characters. Locke gives us a mind-bending, literally, plot line that makes a body wonder if they could really pull such a thing off. The razor thing edge between reality and perception gets even thinner in Trial Run. If I give you too much detail I might just wreck the book for you. I for one don’t like to know too much in advance (that’s actually a little plot drop for you there), I like surprises! Go get yourself a copy of Trial Run, it’s the first in a new series called Fault Lines, but don’t expect to put it down until you’re done! [Book has been provided courtesy of Baker Publishing Group and Graf-Martin Communications, Inc. Available at your favourite bookseller from Revell, a division of Baker Publishing Group.